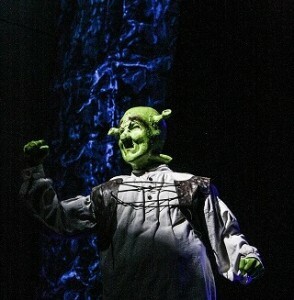 The theatrical production world is unlike anything else out there—getting a group of incredibly artistic people together to whip up costumes, make-up, sets, and decorations, not to mention learning and memorizing lines, songs, musical numbers, dance routines, and other choreography, is no small feat at all. We all here at RW?/SW? 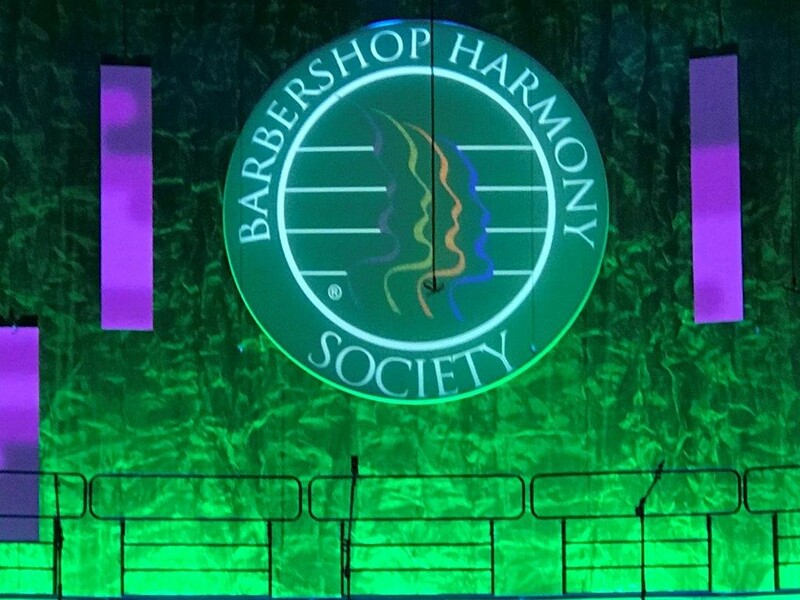 love being able to provide rental and custom drapes to our wonderfully creative clients whenever possible, helping them by taking the stress out of at least one element of the show—the stage drapery! We were thrilled to be able to work with Artistic Director/Theater Teacher, and Virginia Thespian Co-Director Mr. Cimino-Johnson (Mr. CJ to his students) at Rock Ridge High School For the Performing Arts again. 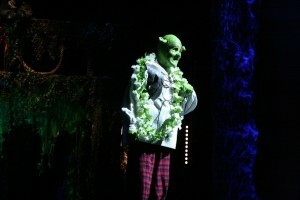 He wanted some unique rental drapes to help create a “false proscenium” on stage for their Fall production of “Shrek—The Musical”. Needing the drapes to be eclectic yet versatile, dramatic yet edgy, and of course have some really cool texture and light like a dream, he decided on renting a few of our Aluminum Metal Mesh rental curtains from our Industrial Textures Drapery Collection. Lightweight and easy to hang, these metal mesh drapes are a stage designer’s dream come true. By simply splashing different hues of colorful lighting onto them, you can very easily create a multitude of different looks and atmospheres using the same exact drapes each time. In this case, Mr. CJ and his talented students did an amazing job using these drapes mixed with some of their personally supplied “erosion netting” to help give the overall look of a stringy, Spanish-moss covered rocky swamp. We look forward to working with this great school again in the future on their truly extraordinary productions, offering them different rental curtains based on their own particular needs. Contact our sales team today so that we can help YOU with getting the most perfect rental—or custom—theatrical stage curtains for your upcoming productions, concerts, and any kind of special events you can think of. Next in our Meet The Staff–UPDATES! Blog series is sales rep extraordinaire, Shane Nelsen. Being the sales staff member who’s been a “Whatter” the longest, he has practically seen it all, done it all, and made it all. 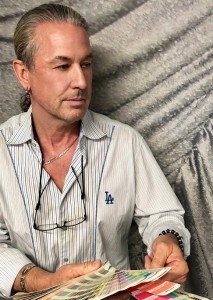 But that doesn’t stop him from still having a blast, and learning from all of his innovative clients’ unique drapery requests. Take a moment to read a little bit more about our very own “design force of nature”, Shane! I was hired back in 2006 as a Sales Staff person, and I still remain in that position to this day. And as of the past few years, I can also assist my clients with requests of our rental inventory, too. 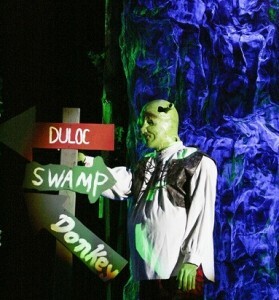 However, due to my decades of work in the decorating/design/theater industry, and now with my many years here at SW? Inc., I am referred to as “Senior Sales Representative”. I enjoy offering my clients AND training colleagues assistance with questions that they might have regarding custom drapery options, various fabrics and substrates, and overall design concepts. What are some favorite memories/circumstances/events from being part of the Sew What? family? Although I truly enjoy our potlucks and special events here on-site, I always especially enjoy our SW outings OUTSIDE the office, too. Years ago a bunch of us went to see Billy Idol live in concert in Palm Springs, and we had such a blast. I also had a lot of fun going to a local concert with some of my co-workers here to see Aerosmith, too. Both shows had our drapes being showcased on-stage, which was exciting to see live and in person…But more than that it was really great getting to socialize with my colleagues outside of our regular work environment. What project have you worked on recently that was interesting or challenging? What did you learn from it? Working from design concept to completion on a Black Sabbath mixed media backdrop was definitely one of my personally most challenging projects ever. Mixing commando cloth, aluminum metal mesh, and black sharkstooth scrim together on one drape–and the painstaking measurements that needed to be calculated to ensure everything was exactly how the client envisioned–was genuinely one of the toughest jobs I’ve ever coordinated here at SW. But it was all worth it because the outcome was absolutely spectacular. Anything more you would like to add about the development and evolution of RW/SW? Inc.? I’ve enjoyed the progress that both Sew What? and Rent What? have made over the last 13 years. I really like working with the expanded sales team and warehouse staff, too, and seeing what new and interesting drapery projects come through our sewing room every single day. 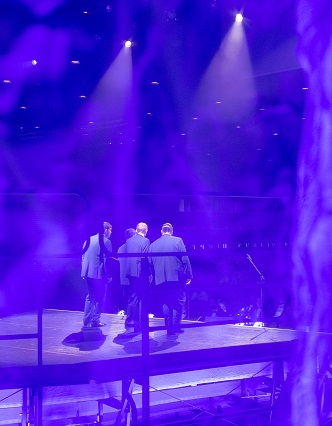 We love seeing firsthand what a dramatic impact the perfect style of stage drapery can have on the general feel and look of a concert, production, convention, or other exclusive event. When they are constructed by using some of our gorgeous, eclectic rental theatrical curtains, well, that makes it extra special! And sometimes what makes it even more extraordinary is when our innovative and artistic clients think “outside the box” on what would typically be a “standard” stage design for their own particular event, thereby making a stage that genuinely dazzles their audience. 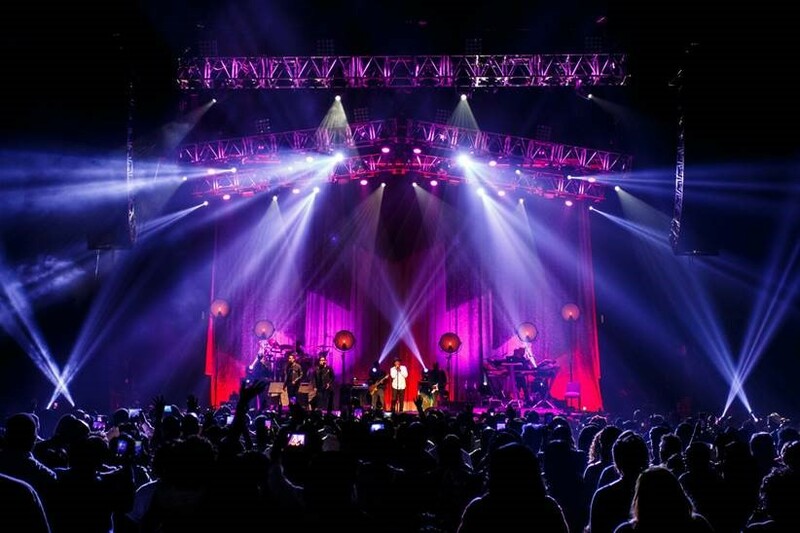 Recently, we were thrilled to work with the visionary production designer Jim McClellan from AEG Presents, a production partner with AEG Live Events. 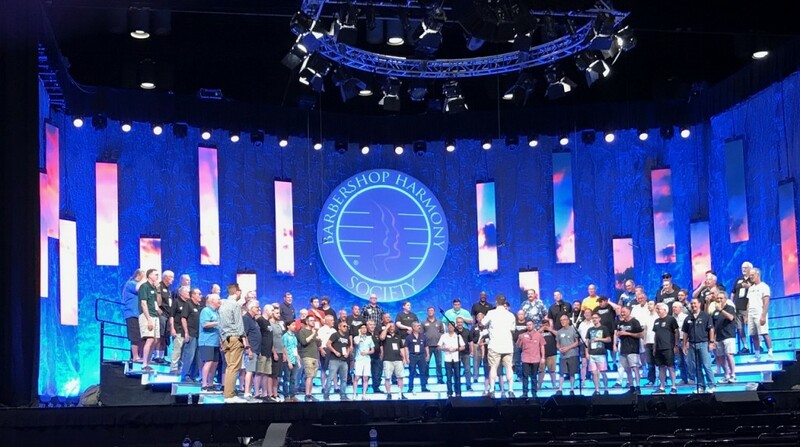 As the event’s scenic designer, he was interested in creating a memorable atmosphere for the very much anticipated yearly Barbershop Harmony Society International Competition. This high-profile occasion would bring in thousands of people all over the world to both participate in the weeklong phenomenon, as well as enjoy it in person and via live streaming from the Orange County Convention Center in Orlando, Florida. This venue had a delightfully large stage set up, so he wanted to use some striking drapes from our Rental Specialty Drapery Collections that would both be stunning in and of themselves, and also versatile enough to really excite this enthusiastic audience from performance to performance throughout the entire competition. 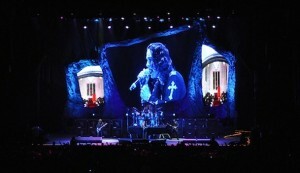 Furthermore, Jim wanted to build an unforgettable stage using rental theatrical curtains that would give a little edginess to the overall appearance of the design, too. Using drapes from our Industrial Textures Collection, he decided on using a wide row of Metal Mesh curtains to be the main backdrop behind the singers and the rest of the stage embellishments. These adaptable drapes are perfect for travelling—they pop out of the hamper ready to hang. The more crinkles on this style of drape, the better to give the stage a wonderfully textured, dynamic façade. They also hung some lovely grey velour panels behind the drapes to add some more dimension and uniformity to the layout. 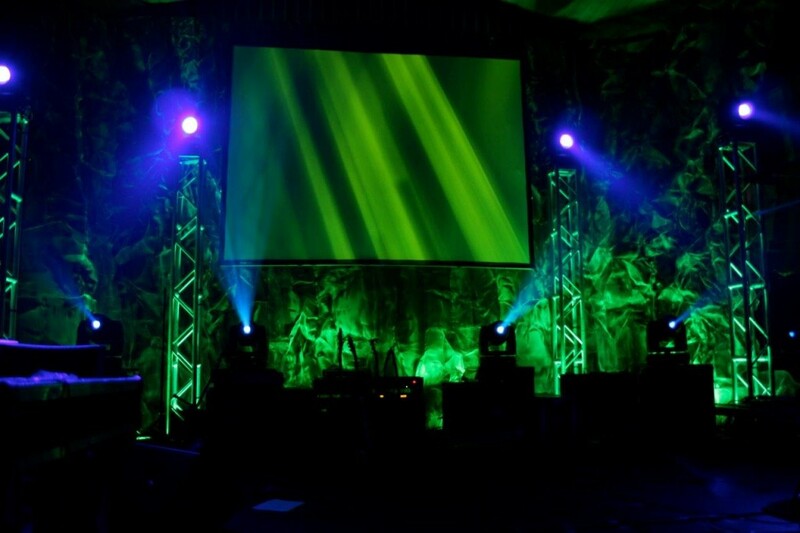 The LED panels and brilliant theatrical lighting provided by Kenny Kightlinger and Ryan Lilly of Logic Systems St. Louis lit up center stage with the event’s logo as well as terrifically colorful splashes of lighting throughout the shows, giving each group their own unique mood and character. 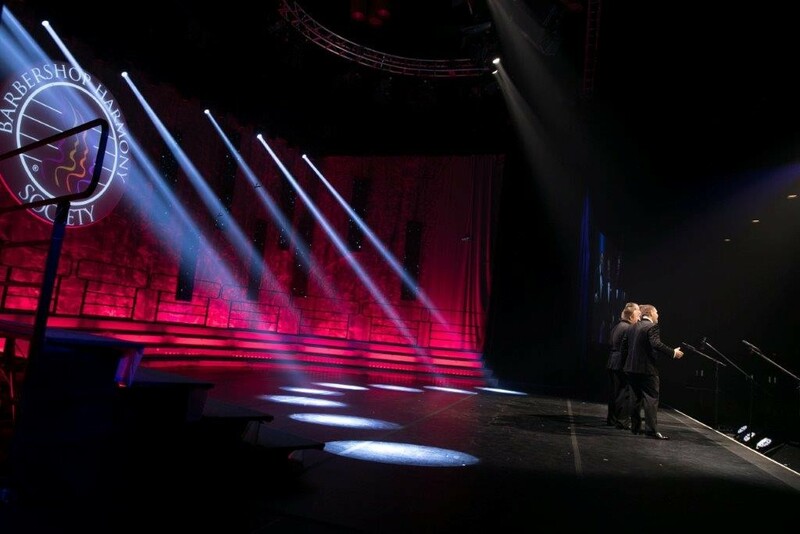 Utilizing projection video supplied by Vision Visuals, and with the video control and cameras all supplied by TNDV, this outstanding production team were able to put together a truly one-of-a-kind, distinctive ambiance for every performance. As you can see with these fabulous photos provided by photographer Jon Read and also from Jim McClellan, the stage design turned out absolutely breathtaking. We loved being a part of their design vision, and were completely blown away with how incredibly remarkable the set looked. We cannot wait to see what design he and his team with AEG come up with for next summer’s competition. Do not hesitate to contact one of our rental drapery specialists today so that we can help you create a magnificent display for your upcoming event or concert, too! Nothing thrills us more that seeing photos of our stunning and dramatic custom-built theatrical stage drapes out in the world for everyone to view and enjoy. Especially when they are photos taken by some extremely talented photographers who share their amazing photographs for the band or artist’s fans to enjoy, long after the concert is over. 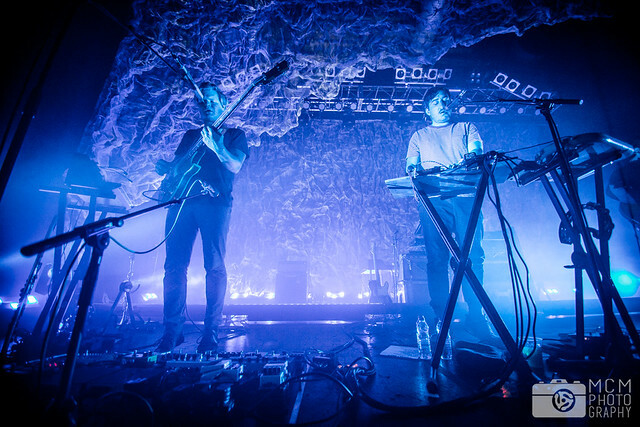 Recently we came across some really spectacular photographs taken of the American rock band Grizzly Bear last fall at the beginning of their current international tour, and we were very excited to share them with our readers. 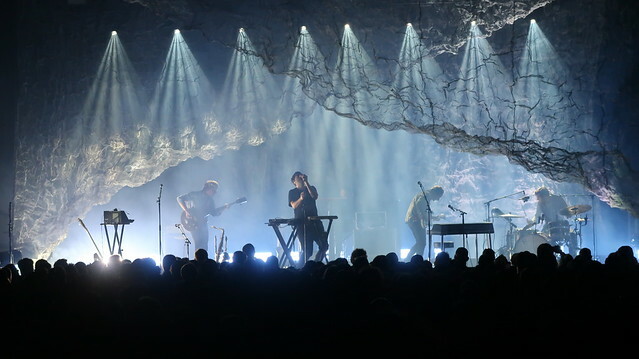 Consisting of four core members, this eclectic rock band from Brooklyn, New York regularly utilizes both traditional and electronic instruments while performing live on stage. Dominated by the use of beautiful–and sometimes haunting–vocal harmonies, their sound has been categorized as psychedelic pop, folk pop, and experimental rock. 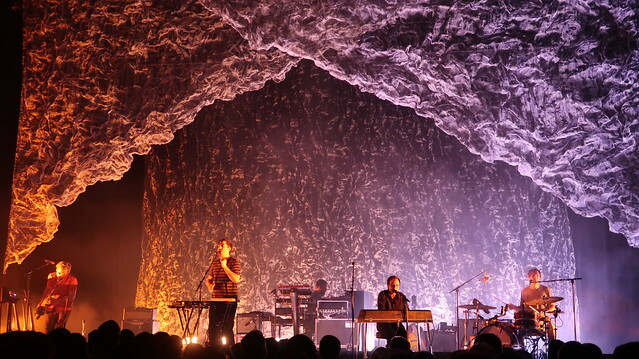 Wanting to create a tour motif that would be as stirring and exciting as their stage performances, they looked for a design that could be layered so that it would better fit stages of all sizes while performing in venues both immense and intimate. Working with the band’s visionary tour manager Adam Richards, our Creative Director and Senior Account Manager Shane Nelsen assisted in helping their design team create a look for their stages that would equally mirror the feel of the new album’s cover (“Painted Ruins”), and yet also be versatile enough to create an exclusive, one-of-a-kind presence to truly wow their fans around the world. 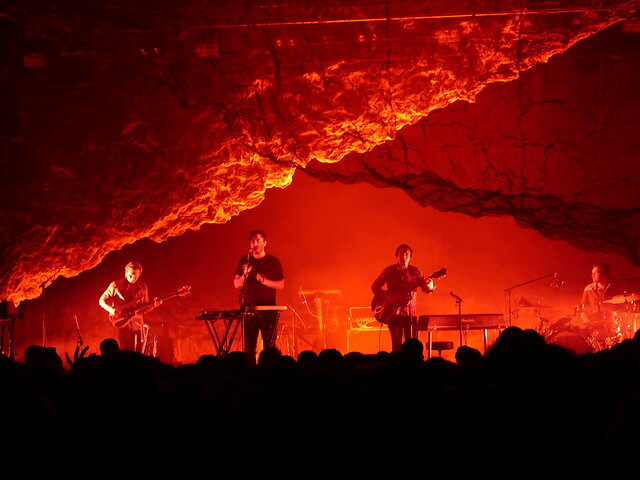 Together they designed some extraordinary, custom-shaped non-flammable Metal Mesh pieces in various sizes, structures, and silhouettes, in order to craft an utterly remarkable and magnificent proscenium for the band’s show design. The brilliance of their lighting and technical designers turned these mesh drapes into all kinds of incredible displays—some looking like the frame of the stage was on fire, others looking like clouds had rolled into the concert hall, and several others with such an exquisite array of colors that they genuinely lifted the spirits of everyone who was there to witness the breathtaking and awe-inspiring spectacle of the show. You can see more of the fantastic photos taken by some of the touring industry’s most talented tour photographers in our new Flickr Gallery. 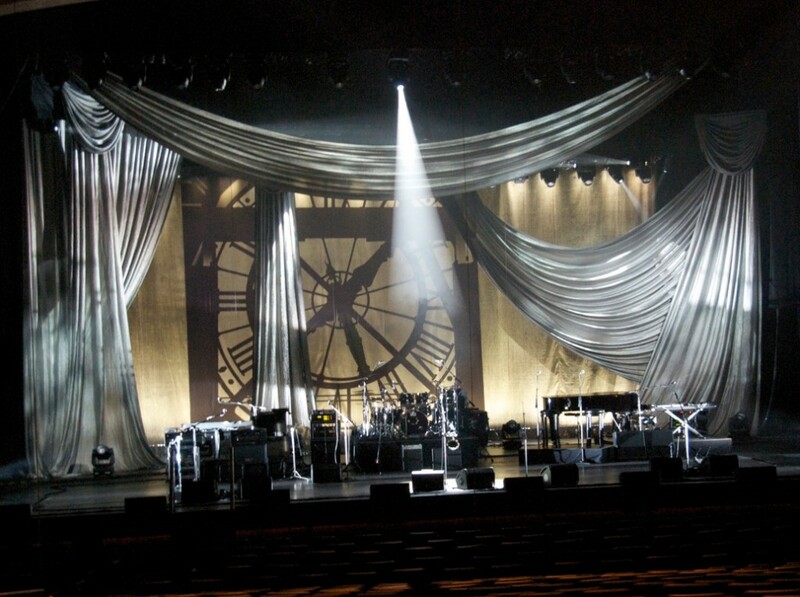 Let us help you create a memorable look for your next big tour with some unique custom-built OR rental curtains, too! Stage designers are always looking for the “next big thing” in staging elements that will help their design undeniably stand out from the rest. Sensational, textured curtains from our Industrial Textures Rental Drapery Collection are becoming the “go-to” collection for edgy, fresh, and innovative stage designs of all kinds, ready to hang–right out of the hamper. Camo Netting, Metallic Mesh, and Textura panels are a fantastic and easy way to add some exciting drama to your event’s motif. Looking for something that will give your stage some dimension, and can layer on top of drapes from any of our rental drapery collections like an absolute pro? Check out our Camo Netting Leg Kit—in versatile 8’w legs from 11’h to 25’h, these independent legs can be hung next to one another to create a very cool proscenium for any kind of stage. Or you can hang them with either layered on top of one another or with extra space in between each panel, to give your venue some very unique depth of field illusions. Lightweight and easy to hang, these drapes are an excellent stage embellishment to add to any in-house drapery as well, allowing each and every venue to genuinely have a one-of-a-kind look. We also offer a spellbounding 23’h x 40’w Black Camo Chaos backdrop—swoops and swags of camo netting, all on top of an IFR Black Poly Muslin base. This drape is perfect when you are going for a multi-dimensional, layered look, all created with a single curtain. Uncomplicated and undemanding, this single piece drape hangs with grommet and ties onto truss or batton. This drape will make it look like you’ve spent a ton of time on your stage design, when you can now spend all that time you’ve saved by working on a brilliant lighting scheme for this backdrop instead. Your secret will be safe with us….! 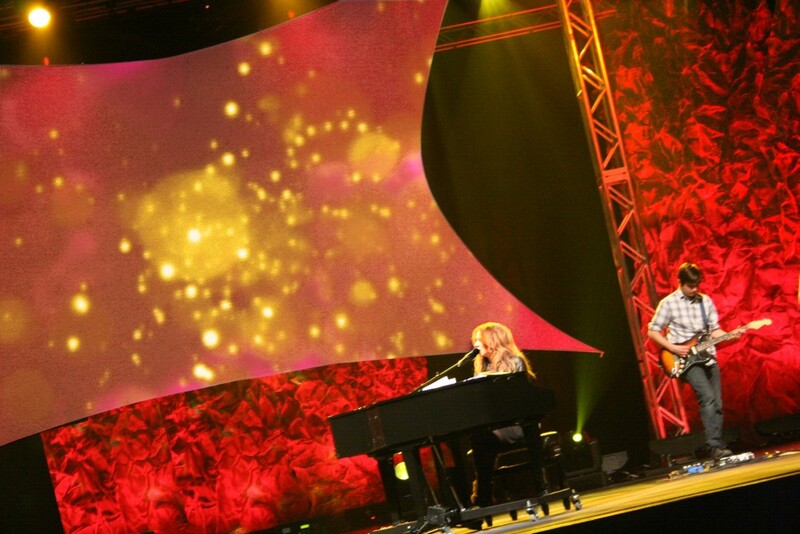 Want your clients to feel like they are rock stars at their next special event? 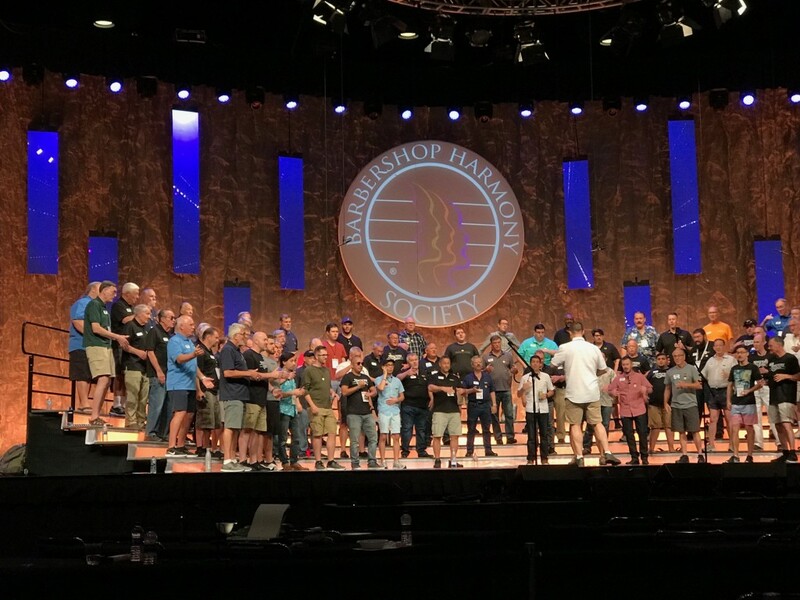 Everyone from churches to trade shows to conventions to—naturally, rock tours—are all enjoying the versatility and excitement that Metal Mesh Drapery adds to their stage design. In legs and backdrops ranging from 23’h to 28’w, you can use these with all kinds of venues, and add a 5’h border to truly electrify your event’s motif. Easy to transport in one of our RW-provided hampers (at no additional rental cost to you), these drapes travel exceedingly well because the “scrunchier” they get in transit, the better! And these drapes take lighting so incredibly well, you can create practically ANY type of feel that you are aiming for. Another incredibly eclectic option you can choose from this rental collection are the stunning Textura Drapes that we have available in shimmery shades of Silver and Pewter. These extraordinarily gorgeous drapes come in pre-pleated legs with grommets and ties on top at 23’h or 30’h x 10’w, adding elegance and flair to all kinds of event design themes. We also offer innovative and superbly lightweight 12’h x 10’4” non-operable Austrian Zip-Walls with hidden ties on top, which enable you to tie them to both a truss system or even pipe and base hardware, and helps make them very easy to install. These remarkable drapes can either zip together to create a stunning seamless backdrop, or used as independent legs to add texture and depth to existing staging. This textured fabric is opaque but still amazingly lightweight and plays with your theatrical lighting superbly. 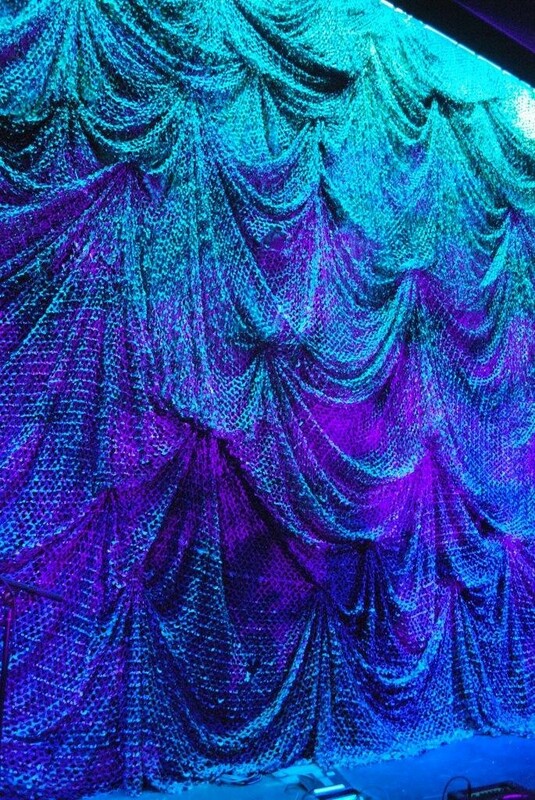 One of the most extraordinary aspects of this rental drapery collection is how effortlessly these drapes all mix and match with one another, AND with drapes in our other specialty rental drapery collections, thereby creating hypnotizing and exclusive stage designs for all kinds of special events. Contact one of our drapery advisors today so that we can help you construct a magnificent and one-of-a-kind stage for your show or production, too.